Thanks for the orthotics. I'm off to Argentina!! I buy a lot of shoes for grandkids and am wondering what shoe brands you recommend for 4 to 12-year-olds. I have bought Tsukihoshi shoes, but they wear away and fall apart fast when used by a kid who plays hard. PS I hope the video below is a good reminder of several important general rules. A Forefoot Valgus Cast sits Inverted on the countertop. The edge of the box is vertical demonstrating the Inverted heel position of the cast. When this type of cast is Root Balanced, the lateral column and the metatarsal arch gets great support. Once the plaster dries, the cloth is removed. The inverted heel position is seen. 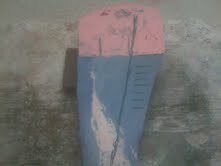 The forefoot is balanced initially with a nail. Plaster is used to make a platform for balancing. The platform will make a dramatic lateral and metatarsal arch. Here the lateral arch is demonstrated. 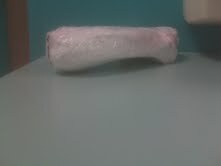 Here the metatarsal area is shown lower than the platform, which will make a great metatarsal arch within the plastic. I have a LLD structural of 9mm on the left leg as per a CT scan. This was found after I strained the hip rotators while squatting. 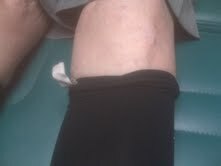 The hip would not heal and I suffered at least 1.5 years of pain for a minor strain! I have also had pain when running to the joint of the big toe on the left foot foot. This was corrected with orthotics. I have a 6mm lift in my flip flops and work boots and this stops the issues with my hip (had the soles adjusted on my american heelers). The problem I have is running when I put the 6mm lift in my running shoes ( hard plastic adjustable type ) this takes away the cushioning proved by the shoes that stop the pain in my joint of the big toe of the left foot. After 1/2 mile of running my joint of the big toe starts hurting. 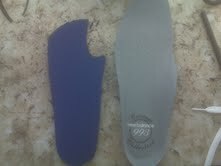 I have 2 pairs of orthotics from different podiatrists the first pair has no lift as this is what I asked for . I wanted to experiment with different lift heights. With a 6mm heel lift I can run without pain, but I get a over worked peroneus longus in the left lower leg. I recently went to a new podiatrist in Hawaii as I just moved here . I don't have much faith in the new podiatrist as there was a lot of delays and excuses in delivery of the inserts . Once delivered I asked how much lift there was as they look the same left and right . The reply was there is 2mm lift as the standard is 1mm per 5mm of LLD . I have measured with caliper there looks to be 1mm max. I do think the lift was forgotten. 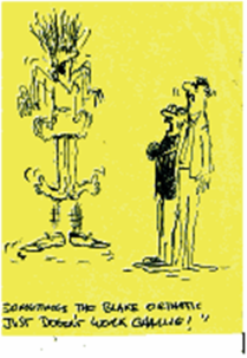 Dr Blake's comment: Never heard of this rule. I'm in the Military and I have to be able to run . Can you provide some advice on how to modify running shoes ? If I just get a pair of running shoes with a lift I suspect they will lose the forefoot cushioning that I need . How much lift do I need for 9mm LLD ? Alot doctors keep telling me that LLD doesn't matter at all. Everyone has some and I just need to run more . I also have had alot of shoulder problems because my posture was terrible . I have spent alot of time trying to correct it and my left mid back gets irritated all the time. Since starting to use the lifts, alot of these issues have started to clear up (especially my shoulders). Dear Dave, Thank you so very much for your email. I am assuming that the left side is short the way you describe it, but let me know if this is wrong. Many doctors ignore the role of LLD (limb length discrepancy or leg length difference). It sounds like you have already found out it can be a valuable factor in balancing your body. I try never to put the lift on the orthotic device so that it can be somewhat adjustable. In sports, but normally when prescribing lifts, I try to keep them full length, with the toe area cut off. As long as you build up under the heel and metatarsals you are doing it correctly. Most athletic shoes take 3/8 inch lifts, and I use spenco/neopreme to accomplish that. 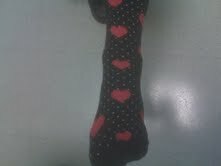 Buy 3 1/8th full length spencos your size, use just the side of the short leg, stand on them and mark between your toes. Then cut out the area of the toes. Use all 3 under the orthotic device on your short side. Since it is soft material, and will compress some on impact and pushoff, you are probably only getting 8-9 mm total which should be enough. If this is the side of your sore big toe joint, cut out that area on one or two of the 3 layers to off weight it. Try to tapper the leading edge of the inserts to smooth the transition somewhat. Here is the lift I imagine for you made off a Spenco knockoff called neolon. It is easy to purchase spenco insoles of your size and use the side only of the short leg. Since you need 3, buy 2 pairs and turn one of the right ones over to make it another left. Cut out 1 to 3 of the layers at the toes and at the ball of the foot for off weighting of the sore big toe joint. 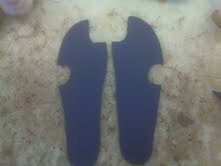 Here is the insole cut appropriately and placed under the shoe insert or orthotic device in your case. If you read all my posts on Short Leg Syndrome you can see that I do not like heel lifts since they can make the ankle unstable (probably why you get peroneal problems) and shift weight forward (not great for big toe problems). 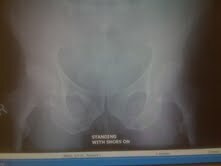 Here is the one of the hip xrays from my patient Albert. Albert has degenerative changes (wear and tear) on both hips, right greater than left. 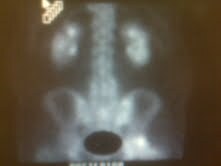 This is a standing AP Pelvic Xray with shoes on showing a short right leg that I am using lifts to level. Albert has had 6 synthetic cartilage injections into both hips, with the left hip doing great and the right hip still in pain. What complicates matters and the decision making for hip replacement is that he also problems with his right sacro-iliac joint and his right lumbar spine. Both areas can produce pain that can mimic hip pain and vice versa. 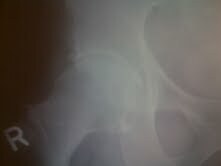 Here is a magnified image of Albert's right hip. The degenerative changes are mild to moderate only. Should he have a hip replacement was the question he asked me? I have seen Albert's function diminish over the last year and now he always has a cane in his left hand. But the xrays didn't look that bad!! His orthopedist was conservative, and really good at telling Albert that he would know when he needed a hip replacement. But was it just referred pain from the SI joint or low back? 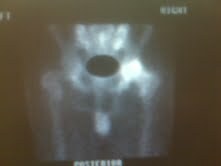 I encouraged him to get a bone scan for more definitive answers. He approached his orthopedist on the subject and the test was ordered. Here is the Tc 99 bone scan images of Albert's hip area. I apologize that the image is turned around, but the side of the intense dye uptake is in the right hip. Bone scans document bone metabolism. Where is Albert trying to mend at the bone layer? The Tc 99 dye glues itself to the phosphorus molecules in your body. Phosphorus, calcium and water make up bone. After 2 hours of letting the dye circulate, the images are collected. Here is a higher image on the body showing the dye in the kidneys already. You urinate the dye out of your body over 12 hours and patients are encouraged to drink alot the day of the test. The lumbar spine looks normal, but there is a slight increase in the right SI joint. But the dye accummulation in the right hip is so intense, Albert will be scheduling a hip replacement soon. Hopefully, we can get his short right leg corrected at the same time. 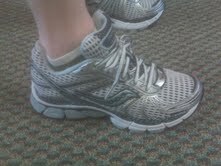 Here is a view of the Saucony Triumph 8 from the side. The shoe is a neutral shoe, which for supinators can be too soft and unstable, but this one seems to work well. As the video says it has some good qualities that make it stable. One of my patients EB brought this shoe to my attention. It works very well for her and she is a significant supinator. 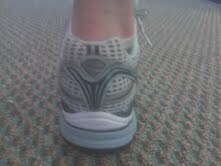 Here is EB in the Saucony Triumph 8 left shoe from the back view. You can see how vertical it holds her foot, although she has an insert to stop some of her supination. Running shoe stores can tend to use to many generalizations and one of them which has always bothered me is that supinators need neutral cushioned shoes. Many supinators, with orthotic devices to correct some or all of that supination, due the best in stability shoes. I am always fighting these neutral shoes when trying to stablize an unstable foot. So, I hope this Saucony Triumph 8 stands the test of time. 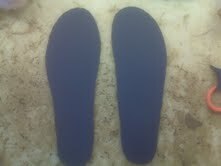 Here is a pair of insoles made of neolon, a knockoff of Spenco. Spenco is the best shock absorping material on the market that I have worked with over the last 30 years. It is shock absorbing and very durable. You can purchase at many retail stores or at www. spenco.com. 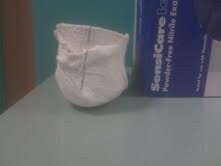 I cover almost all my orthotics, other than dress and Hannaford, with spenco. It is neopreme, the foam rubber you find in wet suits. Here I have made accommodations, or cut outs, for a patient with sore areas under both fifth metatarsals and both big toes. See how the inserts have changed from their original design. This can dramatically change the pressure distribution on the bottom of the feet. Here I have added more accommodation to the bottom of the inserts by taking adhesive felt and placing it next to the cut out areas. 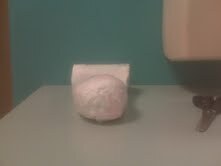 The adhesive felt can be purchased as a roll from http://www.mooremedical.com/ . I use 1/8 inch felt. You can use many products to glue or tape onto the insert to accomplish the off weighting of the sore area. 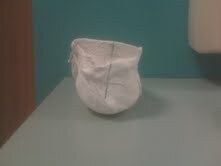 Many of my patients are quite artistic. Photo above shows 1/8 inch or 3 degree varus wedge placed into the midsole of a running shoe for better pronation control. Placing the wedge (up to 3/8 inch commonly used) within the midsole or on the outersole is more powerful support than as a shoe insert. The photo above shows 1/4 inch valgus wedge applied the lateral border of a dress shoe (pinky toe side) to control supination forces. 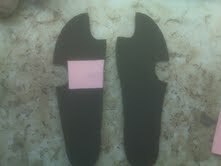 Of course, shoe repair shops will use material that blends into the outersole for better cosmesis. Here is a common version of power lacing where the lst and 3rd eyelets are used, in contrast to the 1st and 2nd. See if one modification feels more comfortable and/or more stable. Power lacing can add 10-20% more pronation or supination support to a shoe, and a must when you are using orthotic devices. The photo above illustrates the point that shoe eyelets are meant to be skipped to alleviate pressure on the top or sides of the foot. It is good to experiment with skipping eyelets when you have bunions, instep pain, or even generalized foot pain to see if it is helpful. In the photo above the shoe is being cut to increase flexibility. Many shoes are just too stiff in the ball of the foot. The cuts should not go all the way to either side or to the bottom of the shoe. Many problems of forefoot pain are helped with the simple modification. However, if it makes the problem worse, you will need some way of stiffening the area, or purchase a new shoe. 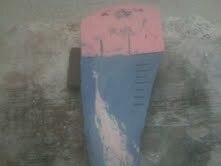 In the photo above tiny cuts are being made into the midsole to allow the shoe to compress more on one side. 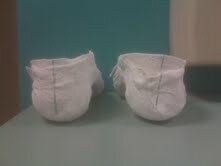 Here the cuts are being made on the medial side (big toe side) to allow the foot to pronate more in a supinator. 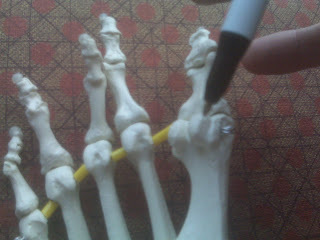 In the photo above, a small slit is placed under the first metatarsal in hallux limitus/rigidus to apply a stiff insert to limit big toe joint motion. In the photo above, adhesive felt is used as a tongue pad to secure the foot better in the shoe, but also to off weight a sore area by the accommodation or cut out area. 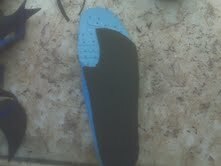 In the photo above, a cut is being made in the heel counter padding to place into the shoe gel padding. This patient was getting irritation from the shoe in this area. A shoe repair store sowed the slit up after I tortured the shoe. In the photo above, this illustrates that any spot of a shoe can be softened to be more friendly to a sore spot. Remember, shoe repair stores need to take your shoe over night to adequately stretch the appropriate area. Here are two positive casts of a patient with forefoot varus. The area under the first metatarsal is marked where problems with the Root Balance Technique can occur. If you use the Root Balancing Technique with forefoot varus, you run the risk of jamming the first metatarsal not allowing crucial first ray plantarflexion for propulsion. The line running obliquely across the foot represents the longitudinal axis of the midtarsal joint. It is important for proper foot function that the weight of the foot passes laterally to this line, keeping both midtarsal joints pronated in midstance and propulsion. When supporting the forefoot varus deformity, the Root Balance Technique can produce too much pressure under the first metatarsal causing long axis supination interfering with proper foot function. This has been a problem long recognized by the orthotic industry. 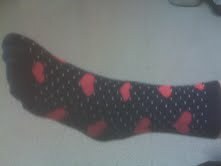 Compromises in support are being made with this foot type daily. It is important to realize that they are compromises, and suboptimal support is achieved. Suboptimal support can lead to poor symptom response, and even the creation of bunions, etc. Even in patients with 2 or 3 degrees of forefoot varus, I will try to modify the correction to place more support proximally with the Inverted Technique or the Kirby Skive. This way the anti-pronation support is not compromised, and the possibly damaging problems associated with full forefoot varus correction are eliminated. Thank you from a Reader!! This is an email I received today. It is so encouraging. I want to say I am so happy to help and this is one of the great aspects of this blog. I just stumbled across your blog and wanted to thank you, particularly for your Sept 16, 2010 post entitled "Sesamoid Fractures: Advice when not healing well." I recently managed to see a podiatrist, 14 months after I slipped while pirouetting after a New Year's party, and it appears that I may have a non-healing sesamoid fracture. Like Jenni from the post, dance is very important to me: I'm griefstricken at the possibility that this injury might permanently reduce my ability to dance. Your response to Jenni has given me an invaluable advance perspective on my possible treatment strategies. and it is infinitely reassuring to find such a thorough and compassionate collection of advice on your blog. Many, many thanks and very best wishes! For those of you not familiar with a sesamoid, you have two under your first metatarsal at the ball of the foot designed to protect the big toe joint and increase the power of the tendon which pulls the big toe downward against the ground for pushoff. When your feet and ankles begin to get swollen as you age, many are treated with support hose. The purpose of this post is only to tell you of one of the pitfalls. When the support hose begins to get loose, patients tend to fold them below the knee thus cutting off the circulation and making matters worse. Here are 2 photos showing first that the left side is stretched out too much. And secondly, the patient responded to the loose hose by folding it back on itself, cutting off the venous return to the heart. If you have any loved ones with support hose, make sure that their hose fits well, and when they remove them, their should not be a deep impression into the skin just below the knee. Here the left support hose is too loose and can be easily pulled above the knee compared to the right one. Here the patient fixes the situation with folding the support hose below the knee, thus cutting off the venous return to the heart. 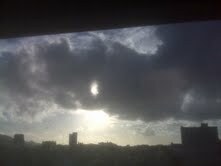 A cloudy but inspiring San Francisco Sunset. These are Forefoot Varus/Supinatus casts which stand in an Everted Position. When you use Root Balancing Techniques to fully correct, you may produce pathological (harmful) blocking of normal first ray plantarflexion with SAGITTAL PLANE BLOCKADE. You may also produce long axis of the midtarsal joint supination (at a time with the midtarsal joints should be fully pronated for stability). So, whereas Forefoot Valgus support with Root Balancing is sacred territory to fully correct, Forefoot Varus support with Root Balancing is filled with land mines and booby traps. More to come. When I am dealing with patients with lateral foot and metatarsal problems, I love when I find forefoot valgus tilts in their biomechanics. The correction for this everted forefoot tilt allows for Maximum Lateral Column and Metatarsal Support at the same time. The cast of the right foot below shows the negative cast capturing this everted forefoot to rearfoot relationship. When the forefoot has an everted deformity, the negative cast will sit inverted. 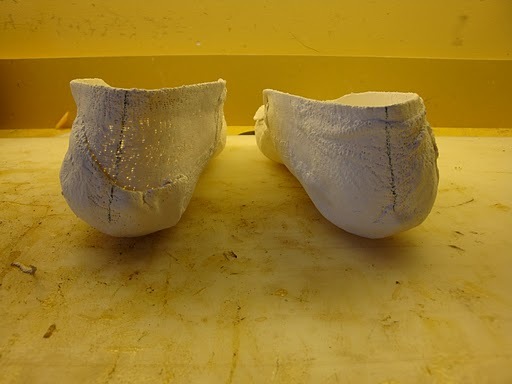 Here the casts are brought back to a more stable heel vertical position in preparation for making the postive cast corrections, and eventually, the orthotic devices themselves. After this cast is filled with solid plaster, it will be leveled to the stable heel vertical position. See how the lateral arch demonstrated here is just as high as some medial arch supports giving great lateral column support. See how this lateral arch support will translate into great overall metatarsal support. Here a little taste of how the process goes at the lab. Once the heel inverted position is noted, a nail is used to bring the cast back to a heel vertical stable position. Then plaster is used to make what is called a platform with the end point where the orthotic device (plastic) will end just behind the weigth bearing surface. Hopefully, this representation of the foot after the platform is in place shows the potential of great metatarsal support. 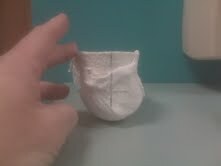 Here the positive cast is placed down with lateral arch in full view. This translates into a great lateral or outside arch. Here is an orthotic device made off a similiar mold with a inside and outside arch so similiar that it is hard to tell what side is the normal arch. Also, easily demonstrated, is how much natural metatarsal arch is created.